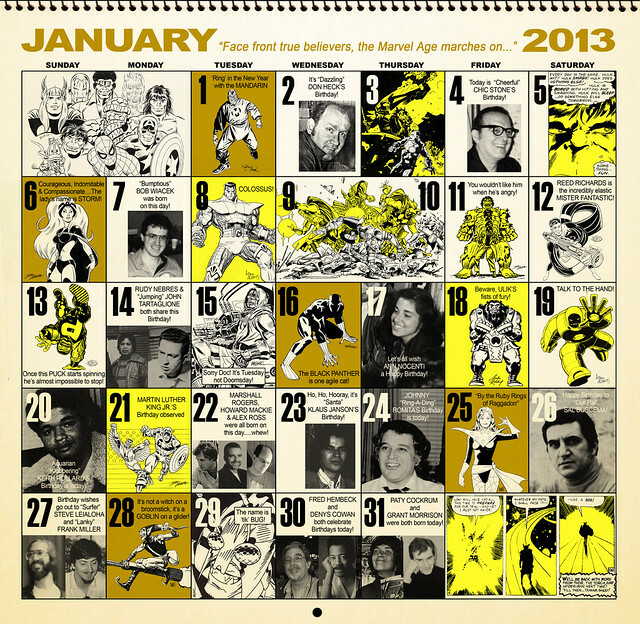 Giant-Size Marvel: Ring in 2013 with a Retro Mighty Marvel Calendar by Dusty Abell! 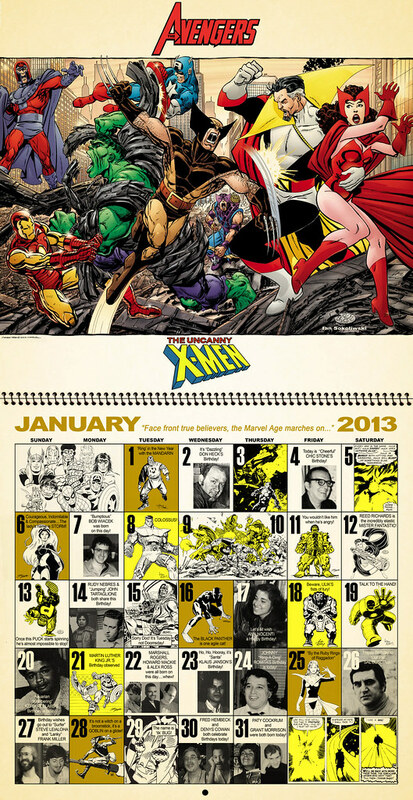 Ring in 2013 with a Retro Mighty Marvel Calendar by Dusty Abell! Who doesn't love the calendars that Marvel started producing back in 1975? Chock full of great art, trivia, and humor on each day of the year. Dusty Abell, who many of you know as an artist of many comics, also missed them--and decided to make a calendar of his own! Man, have I waited a LONG time to finally put this incredibly nostalgic memory from childhood together! This is my take on updating the CLASSIC Marvel Comics Calendars from the the mid 1970's that I grew up loving as a kid, particularly the 75', 76' (Bicentenial Year inspired artwork in that one was crazy fun) and 77' releases. Unfortunately the format was abandoned in the early 80's which has given way to 25 years worth of pretty uninspired calendar releases if you ask me. Well, this is what i'd want to see up on my wall and I hope you might enjoy it a bit as well. A closer look at the bottom portion calendar reveals that it is just like the 1975-77 calendars, filled with trivia about birthdays and corny lines. The birthdays of Don Heck, Chic Stone, Bob Wiacek, Ann Nocienti, Steve Leialoha, Frank Miller and many more are noted. Who knew Paty Cockrum and Grant Morrison were born on the same day? In addition there is classic art aplenty by Jack Kirby, Art Adams, Michael Golden, etc. Check out Dusty's Facebook and DeviantArt pages for more good stuff, including February 2013! Nuff Said.